Decorative Window Film not only reduces up to 99% of damaging UV rays, but comes in a variety of patterns and colors that will enhance any home or office. Decorative window film is compatible with standard clear windows including single-pane, dual-pane, and removable storm pane windows. Decorative window film, also known as vinyl static cling window film, has many benefits. The biggest being that decorative window film uses no adhesives, so it can be easily removed anytime in the future and used over and over again. It can be applied to glass, plastic, Plexiglas, and even metal surfaces, and easily removed leaving no residue. There are some significant drawbacks to static cling decorative window film compared to conventional DIY window tinting films. The first is that optical clarity after installing static cling decorative window film is much worse than conventional window film. If outside the window is a view you want to preserve, it is recommended that you install conventional window film. The second drawback is that static cling films are harder to clean due to its highly static nature which tends to attract dust particles. Nothing special other than soapy water is needed to clean window film. If you are looking to purchase decorative window film, first you need to find out exactly what your needs are. There is a wide variety of decorative window film available, each with its own purpose. Some decorative window films are frosted, making them ideal for use on bathroom windows or shower doors, or anywhere else you may want a little privacy. Some of the more practical attributes for its use is its ability to reduce glare. In addition, many films help to block UV rays; up to 99%. This makes them ideal for windows where the sun comes in the most, and may interfere with TV or computer screens. For these same reasons, it is also an excellent reason to use them on office windows. Such films also tend to be insulating, keeping out the cold and helping keep your home or office efficient. For decorative purposes, there are many beautiful decorative window film designs you can choose from that, if placed on a front window or a mirror, can really enhance your home or office decor. 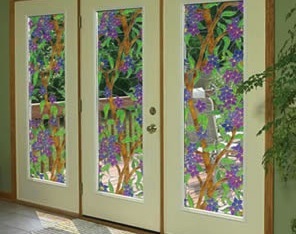 It can even be found in many colors, as well as the frosted window film varieties. Application of decorative window film is fairly easy; just be sure that the surface it is to be applied to is clean and free of dirt and dust. You do not need any special tools or equipment. Decorative window film is a great investment since they are inexpensive, reusable, economic, and can really beautify your home or office. Decorative window film are available from WindowTint.com.